2 Bedroom Detached Mobile Home For Sale in Dollar for Fixed Price £79,000. 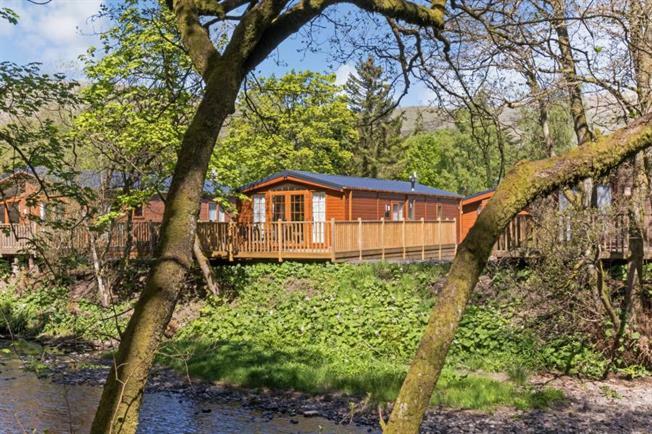 Scottish Riverside Lodge is situated within a luxury Lodge & holiday home park on the outskirts of the picturesque village of Dollar. The lodge has stunning views and sits on the banks of the River Devon providing you with uninterrupted views. This would make either an ideal holiday home or investment property. Management services can be made available if required. The accommodation is of a high standard, and comprises an open plan lounge, dining area and modern fitted kitchen with integrated appliances, one double bedroom and a further bedroom, with the master bedroom having its own W.C. The main bathroom includes a walk-in shower, toilet, sink and heated towel rail and is accessed off the internal hallway. Externally the lodge is completed with a large decked area overlooking the River Devon, with private parking for two vehicles. There is also a private garden area to the side. Situated at the foot of the Ochil Hills, Dollar provides an array of local amenities including a Post Office, local supermarket, a variety of local shops, library and the renowned Dollar Academy. For the leisure enthusiast local leisure facilities include Dollar Golf Course and the Historic Castle Campbell with many footpaths throughout Dollar Glen. The park also offers exclusive fishing rights. Dollar has the advantage of being close to the road network, so is an ideal base for exploring and visiting many attractions across the Central Belt and onto the cities of Edinburgh and Glasgow. The world famous Gleneagles Hotel and Golf Course is only a 25 minute drive away.